The news should not have come as a surprise to anyone. All signs appeared to be pointing to Peterman. That was confirmed this morning by the Bills. As a side note, thank you to Sean McDermott for not being a typical coach and hiding behind the “competive advantage” idea and not telling anyone. When it’s a quarterback, your team, your fans and your community need to know who is starting at the most important position. It would not have been fair to Peterman, the guy you’ve picked, to make him talk around the subject all week and not enjoy the news, and begin to take ownership of the position. But that said, why are the Bills going with the second year player over the highly drafted rookie Josh Allen? There are a lot of reasons, some on the field and some off. Plain and simple, Peterman was the better quarterback during the preseason. That includes the games and the training camp practices. His comfort level with being in the NFL, and being on the Bills, was clear. Yes, he had no real advantage in Brian Daboll’s offense because it was new to everyone. But he adapted quicker and better. Duing the preseason, Peterman was 33/41, an 80.5% completion, along with 3 TD and 1 interception. Even in a glorified scrimmage setting that is the NFL preseason, those are impressive numbers. Yes, he’s a second-year player. With two career starts. I get it, that’s not a lot of experience. But it was more than Allen, and not much less than McCarron. Not only has Peterman been around the team for a year, he played and started as a rookie. Just that familiarity with the routine and pressure of starting and playing an NFL game is huge. It’s not good right now. Will it get better? Yes, with some time. Will it be a top 10 NFL line, probably not. So, the coaches had to decide which QB can do a better job making up for that problem. Peterman’s quick decision making (his best trait) is one way to do that. A QB holding the ball and hesitating is not the formula for success right now. Allen throws a better deep ball. Peterman’s limited arm strength makes him focus on short and intermediate throws. Who makes more sense behind a line that hasn’t yet shown it can protect? The guy who gets rid of the ball. I don’t mean in the pocket by the offensive line. I mean in the rookie’s head. He’s just not ready yet. Emphasis on yet. He will start this season. But why throw him in now? Give him some time to understand the regular season routine and pressure. Let him watch. Let him see how the game unfolds, what defenses do, how coaches adjust. He needs that, like every QB does. It won’t be for long, but Allen will be better for at least watching a few games. So if that’s the case, you need to start the other guy. I sometimes think this is a fan and media thing, and not a coaches consideration because they live in a week-to-week world. But Sean McDermott had to look at the first four games…against Baltimore, LA Chargers, Minnesota, Green Bay…and see a gauntlet of four possible playoff teams. He can’t have wanted to throw a rookie into that. Those are teams that have more talent than the Bills, especially on defense. Why add a bunch of top ten NFL defenses to the pressure on Allen? It just made sense to see how the Bills get through the first month, what kind of team they are, before making the decision to go to Allen. Once you do that, you’re not going back. So give the kid a chance, but not throwing him into the fire. Nathan is the starting quarterback, for now. No guarantees. I think it’s a week-to-week deal. If he plays well and wins, he stays on the field. If he doesn’t and the Bills don’t, then the time to move to Allen will come. We all know that the job will belong to Allen at some point. When? That all depends on Peterman and the team. 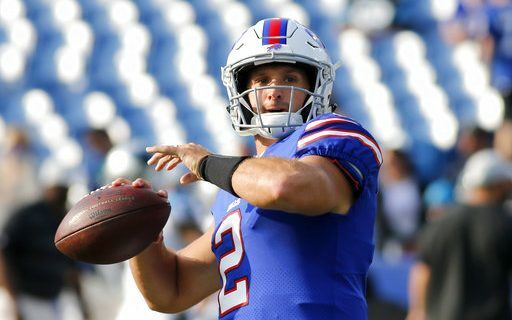 If you believe, like I do, that 2018 is really a season to get ready to break-through in 2019, then the main focus will quickly become getting Allen the reps he needs to be ready for next season. But for now, Peterman has a chance to prove everyone wrong. He has a chance to erase the five interception Chargers game from his resume. He has the chance to be a fifth round draft pick who’s leading an NFL team. He has the chance to live out a dream.